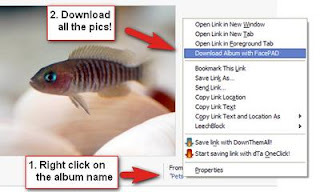 FacePAD is a small Firefox extension that makes grabbing whole albums from Facebook a breeze. Wondered how to check your blog looks like on various browsers for operating systems like mozilla, safari, flock, etc and at different resolutions? You might ask your friends to do it for you, but when you have a free online tool that checks your blogs look on various resolutions on various browsers, why go for the tedious way? Browsershots is a cool handy online tool that helps your blog to be seen on many browsers like Firefox, SeaMonkey, Navigator, Galeon, Opera, IE etc. The good thing is that it throws up previews of your blog on the above mentioned set of browsers on various resolutions and on various operating systems like Ubuntu, WIndows XP, Windows 2000, PLD etc. It’s a fantastic tool, that’s free and completely genuine. Check it out here. Please pass your valuable feedback through comments...! 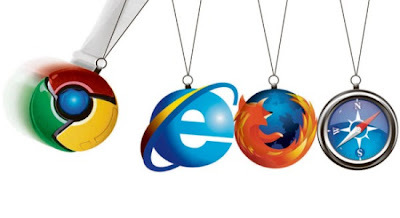 As of April 2010, Google Chrome was the third most widely used browser with 6.73%of worldwide usage share of web browsers according to Net Applications. Even though Firefox is the top web browser used by bloggers, webmasters, web designers and web developers, Google chrome has also grabbed great attention due to its speed and simplicity. Following are some top Google Chrome extensions useful for Blogging,Web design and Development . Some of them are popular as Firefox Add-ons too! Don’t forget to take a look at my other post 25 Best Firefox Add-ons for Bloggers and Web Designers. Please read this post from Google Chrome web browser since you cannot add chrome extensions to other browsers!! This extension auto-detects RSS feeds on the page you are reading and upon finding one will display an RSS icon in the Omnibox, allowing you to click on it to preview the feed content and subscribe. The extension comes with 4 feed readers predefined (Google Reader, iGoogle, Bloglines and My Yahoo) and also allows you to add any web-based feed reader of your choice to the list. Zemanta expands the author’s regular blogging dashboard, populating it on the fly with content suggestions relevant to the current text. It presents images, links, articles, tags in a simple interface. It supports Blogger, WordPress, TypePad, Movable Type, Ning, Drupal, LiveJournal, Tumblr and email platforms Google Mail and Yahoo!Mail. SEO Status is lightweight. It will check the Google Pagerank (PR) & Alexa rank for every page. Using this will also increase your Alexa. goo.gl url shortener is an extension which allows you to shorten the current website URL with the new Google URL Shortener service. Once compressed the url is automatically copied to clipboard and you can share it with Twitter, Facebook, Blogger, Delicious, Digg, MySpace, Google Reader, Gmail or your default mail client. The Web Developer extension adds a toolbar button to the browser with various web developer tools. LastPass is a free online password manager and Form Filler that makes your web browsing easier and more secure. It captures passwords and allows you to make strong passwords easily. Your sensitive data is encrypted locally before upload so even LastPass cannot get access to it! The Picnik Extension for Chrome lets you easily edit the images you come across while browsing the web. With a click you can create a snapshot of your current web page and open it in Picnik for easy editing, annotation and sharing. With this extension, you can double-click any word to view its definition in a small pop-up bubble and view the complete definition of any word or phrase using the address bar dictionary. Feedly organizes your favorite sources in a magazine-like start page. A fast and stylish way to read and share the content of your favorite sites and services. Provides seamless integration with Google Reader, Twitter, Delicious, YouTube and Amazon. Displays the number of unread messages in your Gmail and Google Apps inbox. Preview mail, read, delete, archive and mark as spam. Empower GMail, Google Mail & Google Apps emails with dynamic email signatures. Add Twitter, Facebook, Digg and more. Multiple HTML signatures support. Post to Twitter from the Chrome toolbar. The current page’s title and URL are automatically entered into the textbox for easy posting of links. Share any web page with your friends right from the page you are on. This extension adds a share button to your browser toolbar. Currently support 100+ services like Google Buzz, WordPress, Blogger, Delicious, Digg, Yahoo Buzz, Reddit, Mixx, Facebook, Twitter, MySpace, Orkut, Plurk etc. This extension adds a button to your browser toolbar. Click the translate icon whenever you want to translate the page you’re visiting. RemindMe allows you to setup reminders while browsing and sync them between computers. Speed Tracer is a tool to help you identify and fix performance problems in your web applications. It visualizes metrics that are taken from low level instrumentation points inside of the browser and analyzes them as your application runs. Speed Tracer is available as a Chrome extension and works on all platforms where extensions are currently supported (Windows and Linux). You must be running the Google Chrome Developer Channel to use Speed Tracer. HOPE YOU LIKED THIS POST. PLEASE SHARE AND DROP YOUR VALUABLE FEEDBACK THROUGH COMMENTS! ScribeFire is a full-featured blog editor that integrates with your browser and lets you easily post to your blog. You can drag and drop formatted text from pages you are browsing, take notes, upload images, and post to multiple blogs. Content recommendations while you write. Zemanta helps you enhance you blogs and emails with relevant images, videos, links or tags. Works with WordPress, Blogger, TypePad and others. Seoquake is a Mozilla Firefox SEO extension aimed primarily at helping web masters who deal with search engine optimization (SEO) and internet promotion of web sites. Seoquake allows to obtain and investigate many important SEO parameters of the internet project under study on the fly, save them for future work, compare them with the results, obtained for other, competitive, projects. Yoono is a powerful but easy to use sidebar for Firefox that helps you simplify your online social life by connecting you to Facebook, MySpace, Twitter, LinkedIn, Flickr, Friendfeed, AIM, Yahoo IM and more, all in one place. Yoono is also the easiest way to share stuff with all your social networks – share links, images and video from the page you’re viewing across all your networks simultaneously. Shareaholic is the easiest way to share interesting webpages using Facebook, Twitter, Email, Gmail, Reader, Bookmarks, Buzz, Evernote, Bit.ly, and more. Works with 100+ services. This is the ultimate tool for the link sharing addict. Empower your email signatures in Gmail, Google Apps, Yahoo Mail, Hotmail or AOL. Multiple signatures, Auto insert, Add IM & Social profiles (Twitter, Facebook, Digg, LinkedIn), Add Feeds, Easily add Logo or HTML and more. Organizes your favorite sources in a magazine-like start page. Provides seamless integration with Google Reader, Twitter, Delicious, YouTube and Amazon. Shorten long URL from context menu or toolbar button with your selected URL shortener and display the result in location bar. Supports more than 100 URL shorteners. Xmarks is the #1 bookmarking add-on. Keep your bookmarks, passwords and open tabs backed up and synchronized across computers and browsers. Search smarter with website ratings and reviews displayed with your search results. Online Translator performs real-time translation for Albanian, Arabic, Bulgarian, Catalan, Chinese (Simp. ), Chinese (trad. ), Croatian, Czech, Danish, Dutch, English, Estonian, Filipino, Finnish, French, Galician, German, Greek, Hebrew, Hindi and other languages and their combinations. Fill out Blog Comment Forms easily with your Name, Email, Homepage URL and Message. If you’re into the blogosphere, this is a must have! Clipmarks lets you clip and share specific parts of articles, blog posts or anything else you read on the web. You can post clips directly to Twitter or Facebook – or share them on clipmarks.com and more. Show the IP address(es) of the current page in the status bar. It also allows querying custom services by IP (right mouse button) and hostname (left mouse button), like whois, netcraft. Additionally you can copy the IP address to the clipboard. LastPass is a free online password manager and Form Filler that makes your web browsing easier and more secure. LastPass supports IE and Firefox as Plugins (Opera, Safari, Chrome, iPhone, Opera Mini via Bookmarklets), allows you to import from every major password storage vendor and export too, captures passwords that other managers won’t including many AJAX forms, and allows you to make strong passwords easily. Note: In the next post i am going to post about top 20 google chrome extensions. So,don't forget to come back....! Hope you liked this list. Enjoy Blogging, Designing and Browsing! And don't forget to drop your valuable feedback through comment's....have fun reading. 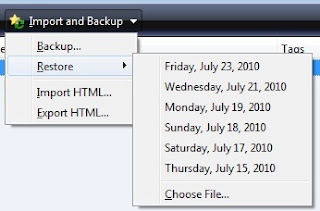 You were trying to organize your favorite bookmarks and accidentally deleted some of them. Well, don’t panic. Here are a few simple steps how you can undo those deleted bookmarks and restore your Firefox in a jiffy. Select Organize Bookmarks from the Bookmark toolbars. Alternatively, you can also press the Control+Shift+B keys which will brings you directly to the Library (Bookmark Manager). Next, click on the button called: “Import & Backup”. Select “Restore” and choose the date which you want to roll back. And you’re done. It’s that simple. Please Pass Your Feedback Through Comments...! Next week, the Black Hat Security Conference is scheduled to take place at Las Vegas. Undoubtedly, hackers attending the event are getting ready with their proof of concepts and exploits. In fact, one security analyst is already making the headlines for discovering security holes in Firefox, Internet Explorer, Chrome and Safari. In the run up to the event, Mozilla is doing its best to keep hackers at bay by patching up as many vulnerabilities as possible. Yesterday, they released Firefox 3.6.7, which is a recommended stability and security update. This release patches 8 critical vulnerabilities including some that could allow remote arbitrary code execution. The full change log along with information about each of the fixed vulnerabilities is available here. Earlier this month, Google had also patched as many as 10 vulnerabilities in a Chrome security update.